The purpose of the sprue, runner, and gate systems is to conduct melt uniformly and with minimum pressure and temperature drops to each cavity, or to the furthest point in a large single cavity. Uniformity of flow means essentially equal flow rates through each gate. This implies equal pressure at the exit from each gate, assuming that all cavities are identical. 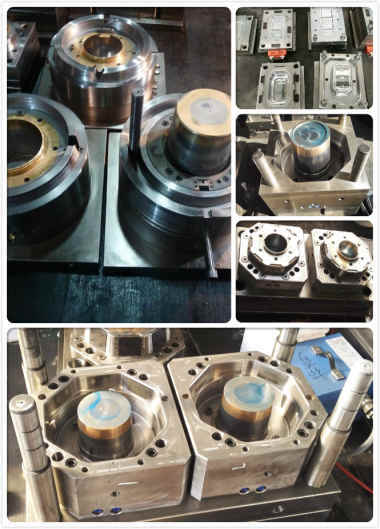 In the case of a family plastic mold injection, the total flows may be different to each cavity, but, in a perfectly balanced design, the various cavities will be completely filled at about the same time. When a cavity pressure control system is used, switchover from injection to holding or packing is controlled by a pressure transducer in one of the cavities. This system works well when all cavities are filled at about the same time. However, if one cavity fills early and its gate freezes before the packing phase is initiated by the pressure sensor in another cavity, it may result in defects associated with insufficient fill and low density. Overpacking also may occur if flows are not balanced. Overpacking would be evidenced by ejection problems and by internal stresses in the moldings. Artificially balanced runner systems, designed using a computer or by experimentation, use runners with varying cross-sectional areas and equalized pressure drops. However, such systems have smaller processing windows because of complex interactions between rheology and heat losses from the runners. For very small parts, it is especially important to have natural balance for stability; the recommendation is to use small runners with high pressure drops. To minimize temperature fluctuations, such molds are preheated for startup and heat is supplied by the circulating coolant. There is not much heat input from the injected melt with small parts. Sprue bushings are generally catalog items, but it is worthwhile to examine the different types available, in light of molding requirements. The main problem in the sprue area is to accommodate the large temperature difference between the nozzle and the sprue. The nozzle must be kept above melt temperature and the sprue, in a cold-runner system, must be close to mold temperature. Keeping the sprue as small as possible, providing a separate nozzle heating band, thermally isolating the sprue, or changing to a hot-runner design are all solutions to sprue area problems. Considering other constraints on the mold design, runners should be as short and streamlined as possible. Runner sizes are determined by compromise. Large runners may fill cavities faster and more reproducibly from cycle to cycle and, hence, tend to produce higher quality parts. However, excessively large runners slow down the cycle by requiring longer cooling times, produce more regrind, and increase the required clamping force. (These objections to large runners do not necessarily apply to hot-runner molds.) Various shapes of runners are used, the most common being the trapezoidal or modified trapezoidal . Runner and gate sizing for a multicavity mold is an iterative design procedure. First, a trial set of lengths and diameters of the runners is assumed. Then, shear rates, shear stresses, and pressure drops are calculated and compared with allowable or desirable pressure drops, as in the following example. Viscosity/shear-rate curves for the polymer at process temperatures are necessary data. Commercial software is available for these calculations.